The Xbox 360 250GB Holiday Value Bundle features two free games, Halo 4 and Tomb Raider (as a Downloadable Token), and one month of Xbox Live Gold membership. Wi-Fi is built-in for easier connection to the world of entertainment on Xbox Live, where HD movies and TV stream in an instant.1 Xbox 360 is more games, entertainment and fun. 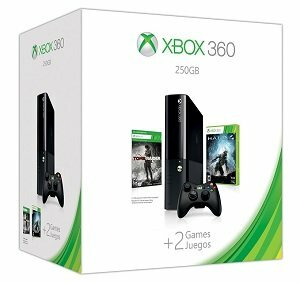 Xbox 360 250GB Hard Drive: The internal 250GB hard drive allows you to save your games and store television shows, movies, music, pictures, trailers, levels, demos, and other content available from Xbox Live Marketplace. Xbox 360 Wireless Controller: This award-winning, high-performance wireless controller features the Xbox Guide Button for quick, in-game access to friends and music. It has a range of up to 30 feet to allow you to play all over your living room. Halo 4: The Master Chief returns to battle an ancient evil bent on vengeance and annihilation. Shipwrecked on a mysterious world, faced with new enemies and deadly technology, the universe will never be the same. Enlist aboard the Infinity to experience Halo’s original multiplayer and Spartan Ops – innovative episodic fiction-based co-op missions. Go Beyond the Story: Halo 4’s Infinity Multiplayer features a vastly expanded suite of multiplayer modes, weapons, vehicles, armor abilities, a new loadout and Spartan IV player progression system. 1. Media content sold separately. Xbox Live Gold membership and/or additional requirements apply for some Xbox Live features. See xbox.com/live. 2. 1080p HD available with select media content; requires HDMI cable, HDCP compliant 1080p display. 1080p HD streaming and 5.1 surround sound requires minimum 4 mbps internet connection. 3. Kinect Sensor sold separately. Look for Kinect enabled games. 4. Broadband Internet required (sold separately). Games, add-ons, and media content sold separately. Xbox Live Gold membership and/or other subscriptions and requirements apply for some Xbox Live features (such as Netflix). See xbox.com/Live. 5. Online multiplayer features require Xbox Live Gold membership (sold separately). 6. Download Tomb Raider with Xbox Live. 6.7 GB storage required. Download card inside.